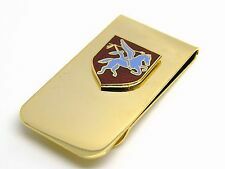 THE ARMY AIRBORNE SERVICE MONEY CLIP. CRESTED BADGE ON. ONE MONEY CLIP SUPPLIED IN VELVET POUCH. MONEY CLIP LENGTH APROX 50MM X25MM WIDE. A set of Airborne Spoof coins depicting 3 images of the Airborne trade, a DC-3 and parachutist, the Pegasus and Bellerophon and the Wings, plated in bronze, silver and gold colour. Standard polyester Para Reg tie. AIRBORNE PARAS BADGE PENDANT. THE ROYAL ARMY AIRBORNE. CRESTED BADGE ON. HEAVY SOLID QUALITY PENDANT IN VELVET LINED CARD BOX. CHAIN LENGTH APPROX 20" WITH BOLT RING FASTENER. OUT OF GOLD PLATED OR SILVER BRIGHT NIKEL PLATE. Airborne Artillery Wall Plaque. Picture Hook Fixing on Rear of Plaque. Specification Size Hand Made in UK For The MOD. Airborne Tie and Airborne Qualification Wings Tie Clip. All our ties are currently supplied to the MOD ( MINISTRY OF DEFENCE ). Tie Clip overall length 55mm Tie Clip is supplied in a box. 1 x Tie Clip. ULTRA LIGHTWEIGHT LASER CUT MTP / MULTICAM PARA MOLLE WEBBING SYSTEM. 10 x PARACHUTE WINGS SUBDUED TAN AND SAND. Parachute Wings x 10. 10 Excellent Quality Para Wings Made From Embroidered Cotton By An MOD Approved Contractor. ARMY AIRBORNE PARAS BADGE CUFFLINKS. THE ARMY AIRBORNE PARAS PEGASUS BADGE. ONE PAIR OF CUFFLINKS. CRESTED BADGE. SUPPLIED IN VELVET LINED CARD BOX. Anodised Black. Brass Backing. Manufactured to the highest standard by MoD approved. Add to Favourites. Picture Hook Fixing on Rear of Plaque. Specification Size Hand Made in UK For The MOD. 1 PARA DZ FLASH. All other Flashes for every AIRBORNE unit available. Airborne plaques is proud to unveil its latest item, British airborne forces Tie. In maroon colour depicting the British parachute wings, which are weaved within the pattern of the material to exceptional standards. ARMY PARAS AIRBORNE PEGASUS BADGE. TOBACCO TIN BOX. CRESTED BADGE ON. ONE TIN SUPPLIED IN PLASTIC BAG. TIN SIZES ARE. APPROX 96 X 65 X 26 MM EXTERNAL SIZES. Airborne Forces 16 Air Assault Brigade. 16 Air Assault Brigade. Ceremonial/Parade Dress Jacket/Tunic Lanyard. Maroon/Sky Blue Rayon Cotton Ceremonial/Parade Dress Jacket/Tunic Lanyard. British Army. - 100% Genuine! Supplied in a display box. NOT including weekends. WIDTH : 20mm. Approx size: HEIGHT: 20mm. Airbourne Division Pegasus Cuff Links. Cuff Links Are Supplied In a Box. Approx Size: Height: 19mm. 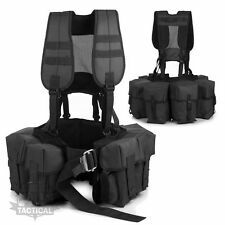 DIY Tactical. There are pros and cons for using a Roll pin belt however using this buckle will allow you to interchange it with your plastic clip from your issue belt without the need for tailoring. New ROLL PIN BELT Buckle. Official CLOTH wings that ARE worn by Para Trained personnel in the RIFLES. Cloth RIFLES WINGS. Qualified Parachutists. Piper green on black.Parachute with wings. Add to Favourites. Manufactured in the UK to the highest standard by MoD approved. PARAS AIRBORNE BADGE WATCH. THE ROYAL ARMY AIRBORNE SERVICE PARAS PEGASUS. CRESTED BADGE ON. ONE POCKET WATCH SUPPLIED IN VELVET GIFT POUCH. POCKET WATCH AND CHAIN. POCKET WATCH APROX 46MM. WITH PLATED CHAIN AND SPARE BATTERY. RAF Bomber Brevet Leather Wallet. Ample storage is provided for bank notes and receipts in the dual-sectioned sleeve, which is lined with durable and natural cotton. RAF Birmingham University Air Squadron Leather Wallet. A hand-finished Airborne Commando Winged Dagger Credit Card Wallet that’s engraved with the Airborne Commando Winged Dagger military insignia and personalised with service details. Genuine leather wallet. Official Multicam Velcro Backed Para Wings. Official Crye Multicam Velcro Backed CLOTH wings. Add to Favourites. 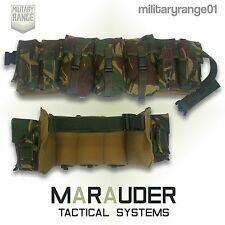 Manufactured in the UK to the highest standard by MoD approved. Airborne Gurkhas Wall Plaque. Picture Hook Fixing on Rear of Plaque. Specification Size Hand Made in UK For The MOD. Approx Size Of Emblem On Front Of Lighter Size Of Lighter Is Approx Lighter is Matt Black. Height: 17mm. SHINEY MIRROR FINISH. THE ROYAL ARMY AIRBORNE PARAS PEGASUS BADGE CREST. ARMY AIRBORNE PARAS PEGASUS BADGE NOTE BOOK. CRESTED BADGE ON. SIZES ARE: 86 X 65 X 8MM APPROX. ==============================================. 2 x PARACHUTE WINGS SUBDUED OLIVE AND BLACK. Parachute Wings X 2. 2 Excellent Quality Para Wings Made From Embroidered Cotton By An MOD Approved Contractor.